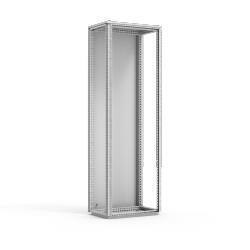 The mild steel combinable floor standing enclosure range, MCSL, is available off the shelf in many different sizes, and is ideal for power distribution applications. The front opening can be segregated with partial panels or doors to meet power distribution system requirements. Only parts required will be delivered, which means full flexibility, lower costs, and greater procurement efficiency will be achieved. Frame: 1.5 painted steel. Rear and roof panels: 1.5 mm painted steel. Seam welded reversed open profiles with 25 mm hole pattern according to DIN 43660. Including integrated external hole pattern. IP 44, 55, 66 | TYPE 4, 12, 13 | IK 10, depending of doors configuration. Frame, rear and roof panel. Delivery also includes earthing bolts. Delivered on a pallet with identical width of the enclosure to allow suiting without removal. All packing material is recyclable. Mild steel combinable floor standing enclosure, available in a wide range of sizes, without a front door and bottom plates for power distribution applications. A flexible solution where customers can choose enclosures that meet their size requirements, off the shelf, in order to create enclosure configurations made up of smaller individual enclosures. The enclosure's front opening can be segregated by mounting partial panels or doors to meet the requirements of the power and distribution system, for example, for a motor control centre (MCC). Providing an application specific product ensures that customers costs are reduced, as the parts of the enclosure that are not required are not received, which in turn increases procurement efficiency. The enclosure's front opening needs to be fully covered by using specified parts, such as partial doors, DP, or partial panels, DPP, in order to achieve the stated protection degree.